Besides CPK knives, whaddaya like? Discussion in 'Carothers Performance Knives' started by Lorien, Jul 21, 2016. There are probably a good number of people on the forum that may not know it is the heaviest wood in the world and will not float, period. Until the late 50's, it was used in ships for certain bearings, because it happens to be self-lubricating. Hard to imagine, and pardon me for lifting the following text from online, where i got an education on LV and it's amazing properties, over the years. "The aft main shaft strut bearings for USS Nautilus (SSN-571), the world's first nuclear-powered submarine, were composed of this wood." I'm a huge fan of LV and glad to see it getting some love here. The real stuff is amazing but I like the "almost as good" quite a bit as well. It is bug-proof and rot proof. They have actually found posts from houses made from LV buried in the ground that pre-date the birth of Christ. It is also reactive to UV light and the lighter toned wood will turn wonderful hues of green when exposed to sunlight. fonedork, Fullflat, benchrest308 and 11 others like this. Wow! That’s amazing! This LV is really interesting wood. Look forward to seeing your pics. Thanks for the tip Chad. I think my LV is going to get a little sunlight! Fullflat, Odog27, woodysone and 2 others like this. LV is, indeed, a very special wood. There are so many stories, such as those mentioned above by cpirtle. Phill50, Fullflat, Odog27 and 3 others like this. fonedork, cpirtle, gusbuster and 1 other person like this. PolRoger, prom52, donscpoo and 16 others like this. Half Face Blades. Serious tools. I had this one made as a retirement gift to myself. I have a couple others including one of his mini-tomahawks. Mike157, gusbuster, Organic556 and 8 others like this. David45, fonedork, prom52 and 8 others like this. This piece shows a lot of the variation LV can have, everything from the darker browns to the greens to the creams. The side grain is spectacular. 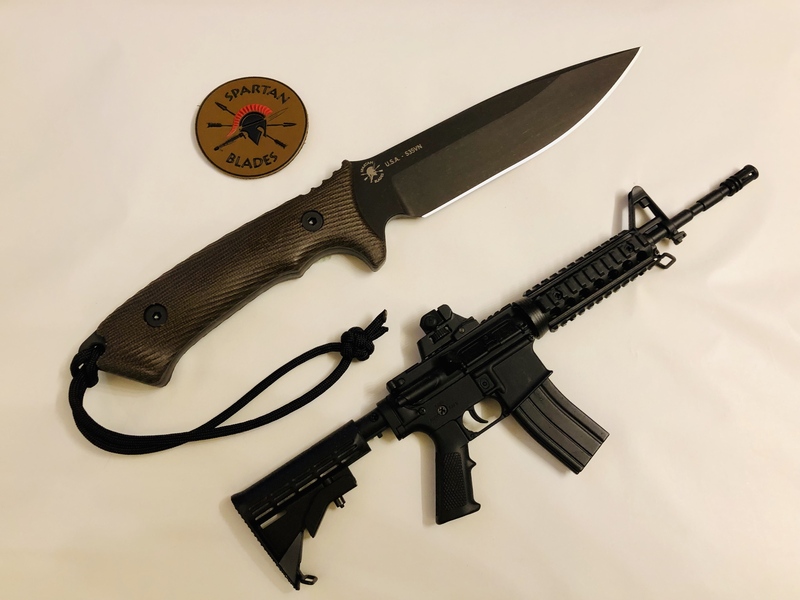 The knife shown is a Michael Moing Higonokami and the hawk is a DLC Coated MT-1 from Red Rock Rifleworks, both soon to be fitted with proper leather. vkp78, untytled, Odog27 and 8 others like this. That’s some nice LV Chad, and the knife and hawk aren’t too shabby either! cpirtle, Odog27, Mike157 and 1 other person like this. 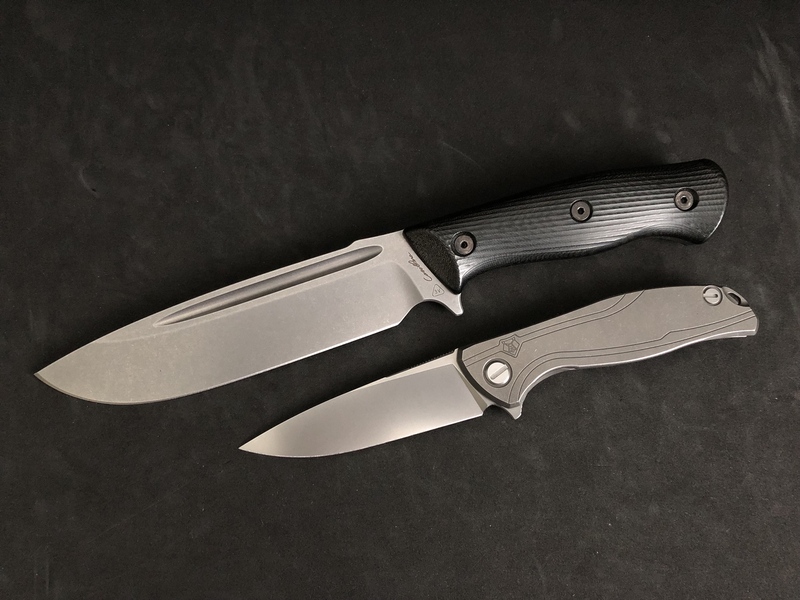 Some time in the past year, one of the regulars here graciously gifted me an ESEE4 with micarta slabs (which might be the most accurate description of the stock handle) and black coated blade. It was a gift because he knew I always wanted one as a project knife. I tried to do this one justice. Over the past year I collected up the materials. Knowing I was going to put a dark patina (red wine vinegar and mustard) I wanted a lighter handle. These scales are spalted eucalyptus and have some great rays that flash pretty well. Blue liners because black seemed too severe. Mosaic pins because, well, look at 'em. After stripping and fitting the handles the blade got tumbled for an hour in a large stonewash/tumbler at my work. 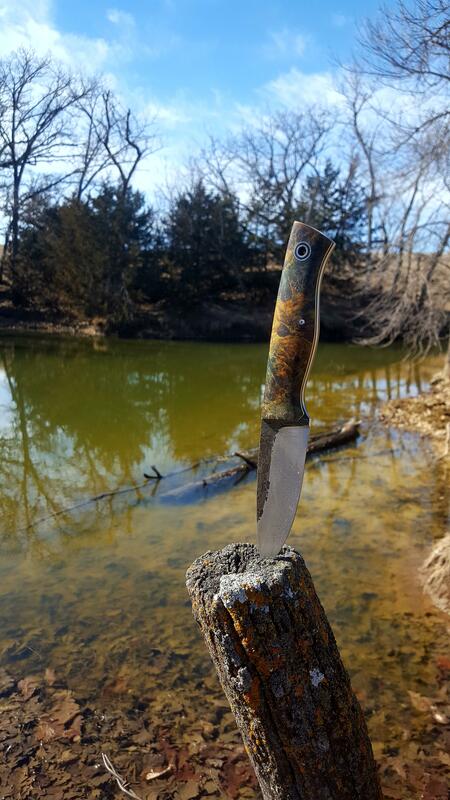 Then the patina. donscpoo, mpjustin, Mike157 and 20 others like this. donscpoo, Mike157, Grenock and 8 others like this. 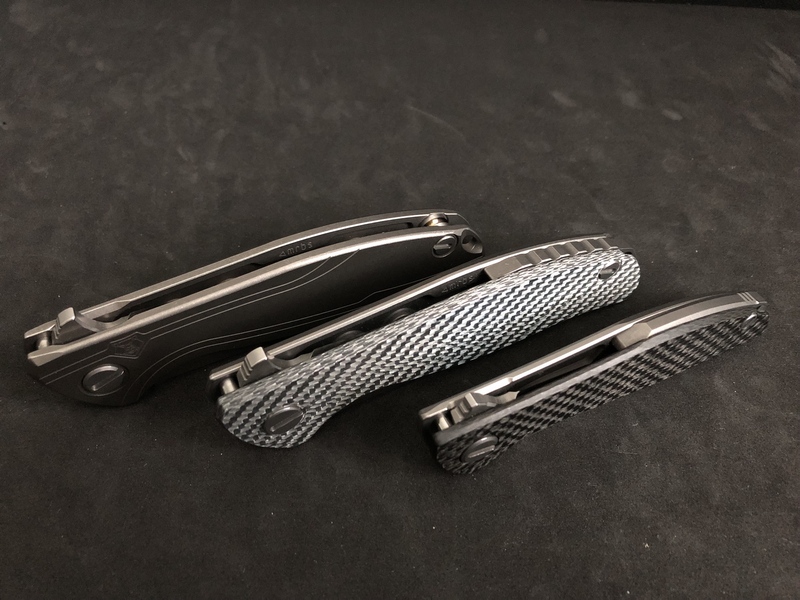 Spartan "Horkos", and "Ronin Shinto" Both in a handle material soon to be offered by CPK "Double Black Canvas"
EDIT: My Source tells me the Double Black is actually easier to Machine than the Regular Black Canvas. donscpoo, DJC72, duramax and 13 others like this. ^^^One or the other of those would look amazing with some cocobolo or rosewood that has some tan streaks in it. duramax, gusbuster, woodysone and 5 others like this. duramax, Grenock, gusbuster and 10 others like this. 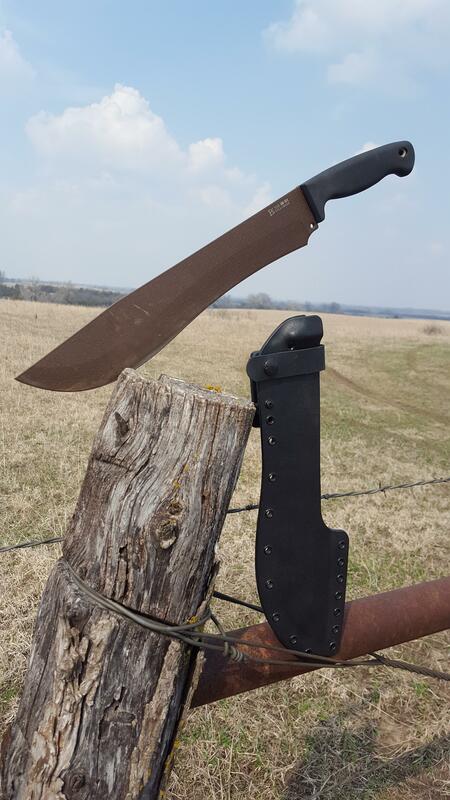 that's a big damn knife! Odog27, - SpyderMan -, gusbuster and 1 other person like this. Fullflat and Odog27 like this. TommyGun56, cpirtle, Organic556 and 10 others like this.